Understanding carbon partitioning in cereal seeds is of critical importance to develop cereal crops with enhanced starch yields for food security and for producing specified end-products high in amylose, β-glucan, or fructan, such as functional foods or oils for biofuel applications. Waxy mutants of cereals have a high content of amylopectin and have been well characterized. However, the allocation of carbon to other components, such as β-glucan and oils, and the regulation of the altered carbon distribution to amylopectin in a waxy mutant are poorly understood. 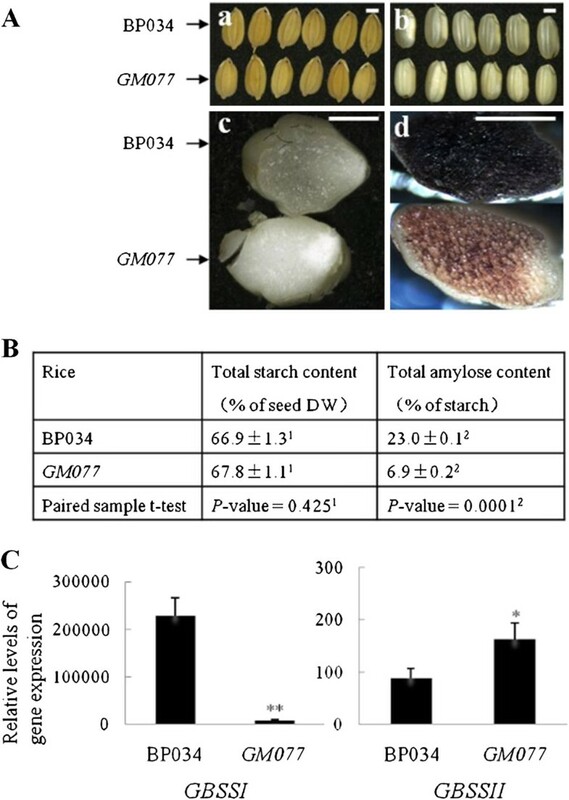 In this study, we used a rice mutant, GM077, with a low content of amylose to gain molecular insight into how a deficiency of amylose affects carbon allocation to other end products and to amylopectin. We used carbohydrate analysis, subtractive cDNA libraries, and qPCR to identify candidate genes potentially responsible for the changes in carbon allocation in GM077 seeds. Carbohydrate analysis indicated that the content of amylose in GM077 seeds was significantly reduced, while that of amylopectin significantly rose as compared to the wild type BP034. The content of glucose, sucrose, total starch, cell-wall polysaccharides and oil were only slightly affected in the mutant as compared to the wild type. Suppression subtractive hybridization (SSH) experiments generated 116 unigenes in the mutant on the wild-type background. Among the 116 unigenes, three, AGP, ISA1 and SUSIBA2-like, were found to be directly involved in amylopectin synthesis, indicating their possible roles in redirecting carbon flux from amylose to amylopectin. 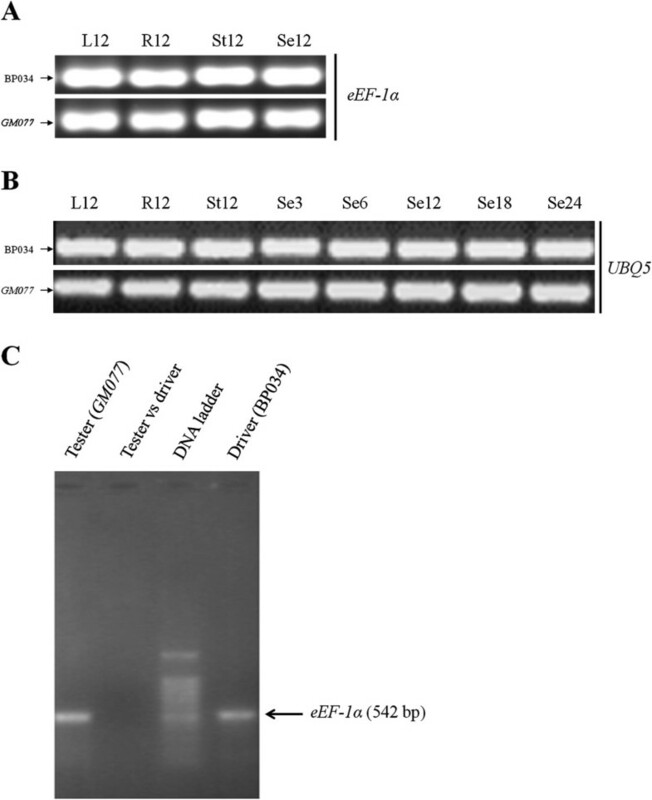 A bioinformatics analysis of the putative SUSIBA2-like binding elements in the promoter regions of the upregulated genes indicated that the SUSIBA2-like transcription factor may be instrumental in promoting the carbon reallocation from amylose to amylopectin. Analyses of carbohydrate and oil fractions and gene expression profiling on a global scale in the rice waxy mutant GM077 revealed several candidate genes implicated in the carbon reallocation response to an amylose deficiency, including genes encoding AGPase and SUSIBA2-like. We believe that AGP and SUSIBA2 are two promising targets for classical breeding and/or transgenic plant improvement to control the carbon flux between starch and other components in cereal seeds. Cereal crops are of critical importance in agriculture. The top three cereals in global production (2009) are maize, wheat, and rice, with 819, 686 and 685 M tonnes, respectively (http://faostat.fao.org). Cereal crops constitute our largest primary food source and are also highly used in food and non-food industrial applications. Contributing factors to the importance of cereals are that they can be bred to be very high yielding, that cereal grains lend themselves to long-term storage, and that the grain can accumulate different types of carbohydrates and lipids. Major carbohydrates in cereal caryopses are the starch components amylose and amylopectin, cell wall components, such as different types of arabinoxylan, mixed-linkage β-glucan and cellulose, fructooligosaccharides, fructan, and sucrose [1, 2]. Interestingly significant amounts of oil can also be stored in the endosperm, especially in oats . The composition of the cereal grain dictates the end use of the crop. For example, the cereal endosperm is the most important source of starch worldwide [4, 5] and is therefore of tremendous value for food security. There is an ongoing search for genotypes with high content of amylose, β-glucan and/or fructan for different applications within the functional food sector [6–8]. At the other end of the spectrum are efforts to develop cereals that redirect carbon flux from carbohydrates to oils for production of high-density biofuels [9–13]. A thorough understanding of the mechanisms for the partitioning of photosynthates in cereals is crucial for our ability to boost starch yield, to develop specialty crops for the functional food industry, such as barley with enhanced ß-glucan levels, and to tailor cereal production for the non-food industry. Carbon partitioning in higher plants has been studied at the whole-plant level [14, 15], for certain types of plant tissues [16–18], and for plant cells . However, many questions remain unanswered. For example, we need to identify and map the actions of key elements that determine carbon allocation between source and sink tissues and that govern carbon flux along pathways for synthesis of different carbohydrate and oil sinks. It is also imperative that we gain insight into how environmental factors influence carbon partitioning [4, 20]. Several proteins have been implicated as important players in carbon partitioning in plants. They include proteins involved in sugar transport and metabolism, such as sucrose transporters , sucrose invertases  and sucrose synthases [23, 24], and in hexose metabolism and transport, such as hexose kinases  and monosaccharide transporters . Other examples include proteins controlling the flux in polysaccharide biosynthesis, such as ADP-glucose pyrophosphorylase , and UDP-glucose pyrophosphorylase [28, 29], and regulatory proteins, such as sucrose non-fermenting-1-related protein kinase , trehalose-6-phosphate synthase , and transcription factors [12, 32–35]. We are interested in identifying molecular switches in cereals that direct carbon flux to different tissues and into the specific end products. We are particularly concerned with carbon partitioning between amylose, amylopectin, oil, β-glucan and fructan in cereal seeds. For the present study, we chose a rice waxy mutant, GM077, which is deficient in amylose biosynthesis. We examined carbon partitioning between amylose, amylopectin, oil, β-glucan, fructan and other dietary fibers in the GM077 background, a nearly isogenic waxy line. We constructed a suppression subtractive hybridization (SSH) cDNA library between the mutant and the corresponding wild type to identify potential candidates involved in carbon partitioning. We used qPCR to verify results from the SSH experiments and to study how gene regulation controls carbon allocation in the absence of amylose biosynthesis. Waxy rice has been drawing much attention in rice breeding in China as it has many applications in traditional Chinese food and brewing. This has resulted in a large collection of waxy rice in the Chinese rice germplasm repositories and also in a number of breeding programs on the different qualities of waxy rice [36–38]. We selected one waxy rice cultivar, GM077 (code No. GM077; Bao et al. unpublished), mainly based on the following factors: i) It is a stable mutant with a nearly isogenic background; ii) It has a relatively low amylose content (see also below) compared to other waxy mutants; iii) With the exception of its waxy grain character, GM077 is phenotypically similar to its wild-type counterpart BP034 (code No. BP034), an elite variety of Indica rice (also cultivated under the name Guangluai No. 4 in Southern China) [38,Bao et al. unpublished] (Figure 1A-C; Additional file 1). When the grains of GM077 were cut transversely and stained with an iodine solution, a typical reddish color of waxy starch was revealed in the endosperm [39, 40]. 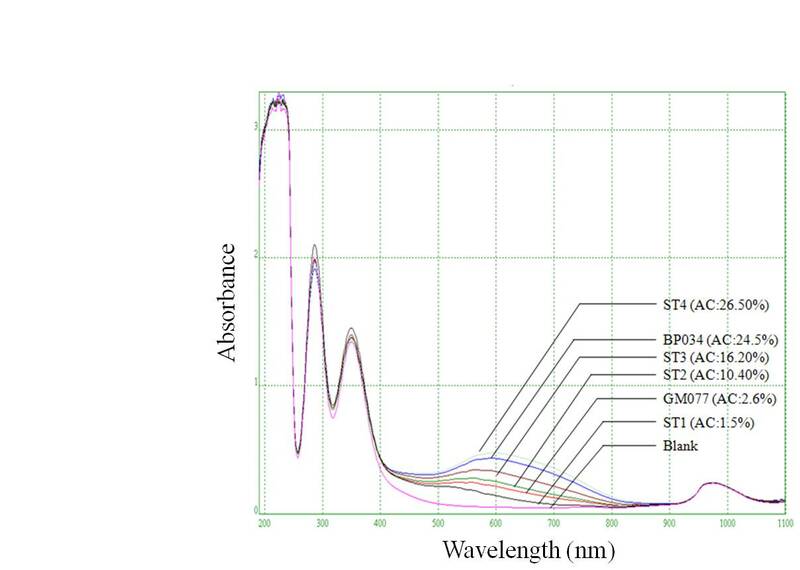 We have further characterized the grain starch of GM077 by recording the light absorbance of the starch-iodine complex between 200 nm and 1100 nm with a scanning spectrophotometer. We included internal standards of starch with known contents of amylose. As seen in Additional file 2, the absorbance value around 595 nm for the amylose-iodine complex was reduced proportionally with the amylose content in the starch samples, including those from the wild type (BP034) and mutant (GM077). Based on the absorbance, the estimated amylose content of BP034 and GM077 is between standards 4 (26.5%) and 3 (16.2%), and standards 2 (10.4%) and 1 (1.5%), respectively. The estimations were confirmed with chemical analyses revealing a significant difference (P = 0.0001) in amylose content of 23.0% and 6.9% in kernels of BP034 and GMO077, respectively. The starch content was around 67% in both types of rice grains (P > 0.05) (Figure 1B). Demonstration of GM077 as a waxy mutant using the corresponding wild type BP034 as a control. (A) Phenotypic traits of BP034 and GM077 grains. The grains, with and without hull (a and b, respectively), are visualized. Transverse sections of the grains without and with iodine-staining were photographed (c and d, respectively). Scale bars (=1.5 mm) are indicated. (B) Content of total starch and amylose was determined as Sun et al. . 1No significant difference of total starch content between BP034 and GM077 (P = 0.425). 2Significant difference of total amylose content between BP034 and GM077 (P = 0.0001). (C) qPCR analysis of expression levels for GBSSI and GBSSII. DW (dry weight), GBSS (granule-bound starch synthase). The statistical difference between BP034 and GM077 is presented as “significantly decreased” (**P < 0.01) and “increased” (*P < 0.05), respectively. It is generally accepted that amylose synthesis is carried out by granule-bound starch synthases (GBSS). Cereals have two forms of GBSS, GBSSI and GBSSII [41, 42]. GBSSI is responsible for amylose synthesis in storage tissues, such as endosperm, whereas GBSSII is present in green tissues, including the pericarp of seeds. We used qPCR to analyze gene expression for both GBSS genes in rice seeds with the ubiquitin gene, UBQ5, as an internal standard. The qPCR results showed that, in GM077 seeds, gene expression of GBSSI was significantly reduced (Figure 1C) and the expression of UBQ5 is about the same as in the control BP034. Expression of GBSSII was significantly increased in GM077 as compared with BP034. We have shown that the GM077 rice is a waxy mutant caused by down-regulation of GBSSI. Yield, kernel weight and starch content were similar between the waxy mutant and the corresponding wild type (Figure 1B; Additional file 1).To gain insight into the redistribution of carbon in the GM077 seed, we subjected the mutant and wild-type lines to carbohydrate and oil analyses. Carbohydrate analyses revealed that both GM077 and the parental BP034 lines contained about 3% dietary fiber with similar compositions (Table 1; Additional file 3). Arabinoxylan and cellulose were major dietary fiber components (about 1% of dry caryopsis each) while mixed-linkage β-glucan and fructan were minor components. Consequently, no extra carbon was distributed into the cell walls or to the β-glucan or fructan sink in the GMO77 mutant. The starch content was slightly reduced in the waxy mutant (67.5% of dry caryopsis) compared to the wild type (69.3% of dry caryopsis) (P < 0.05). The amylose content was normal in the wild type (24% of the starch) but highly reduced in the waxy mutant (3.9% of the starch) (P < 0.01). Thus the amylose content in the seed was reduced from 17% of the caryopsis in the wild type to 2.6% in the waxy mutant (P < 0.01). The reduced content of amylose was mainly compensated for by an increased content of amylopectin in the waxy caryopsis, 65% in the waxy mutant compared to 53% in the wild type. The content of sucrose and crude oils were the same in the two rice lines (P > 0.05). The glucose content in the GM077 mutant (0.2%) was somewhat higher than the wild type (0.1%) (P < 0.05), but was low in both lines. *Mean value from three independent analytic experiments using randomly selected caryopses from a pool of six plants (see table S3). **Sugar residue. The carbohydrate analysis thus indicated that a major fraction of carbon in the waxy mutant GM077 was reallocated from amylose to amylopectin synthesis. This result prompted us to try to identify the genes in GM077 responsible for this reallocation. To this end, we employed the SSH strategy (see below). We used GM077 as the tester and BP034 as the driver to construct a cDNA library after PCR amplification and SSH of cDNAs from total RNA isolated from plants at 12 days after flowering (daf). The resulting SSH library of “GM077 vs BP034” contained 471 clones with an average length of around 500 bp. All positive clones were applied to sequencing, which returned the identification of 116 unigenes. These 116 unigenes were used for the clusters of orthologous groups (COG) functional annotation analysis  after BLASTX and TBLASTX against the NCBI protein databases. Among the 116 unigenes, 90 exhibited high similarity (E-value < 10-5) to known protein sequences, and 26 showed no similarity to any reported sequence. Within the 90 protein sequences, 26 lacked functional annotation. The rest of sequences were categorized in four functional groups: “information storage and processing”, “cellular processes and signaling”, “metabolism”, and “poorly characterized” (Figure 2; Additional file 4). These four functional groups have 12, 21, 23 and 8 unigenes, corresponding to 10.4%, 18.1%, 19.8% and 6.9% of the total unigenes, respectively (Figure 2). The details of the unigenes and their putative functions are shown in Table 2. Interestingly, two unigenes (clone ID No. A74 and ID No. 2B03), similar to the genes for ADP-glucose pyrophosphorylase small subunit (AGPS; GenBank accession No. ACJ86329.1 of the Indica group and GenBank accession No. AK103906 of the Japonica group) and isoamylase (ISA; GenBank accession No. BAC75533.1 of the Japonica group), respectively, were found in the carbohydrate transport and metabolism group. Notably, one clone (ID No. D25) in the group of no related COGs showed a high similarity to WRKY transcription factor 34 (GenBank accession No. NP_001060116.1 of the Japonica group). Further sequence analysis of the genes for isoamylase and WRKY transcription factor 34 revealed that they are rice orthologs to barley ISA1 and SUSIBA2, respectively, previously described by Sun et al. [34, 42]. Functional classification of the 116 unigenes from the subtractive libray of GM077 vs BP034. The classification was based on BLASTX and TBLASTX results (E-value < 10-5) using the expressed sequence tags (ESTs) of the unigenes. Genes are categorized using the NCBI KOGnitor COG classification . The number of unigenes in each group is indicated and their percentage in the total number of unigenes is denoted. To verify the conclusions from the SHH experiment, we selected two housekeeping genes, the gene for the eukaryotic elongation factor-1 α subunit (eEF-1 α) and UBQ5, to follow the SSH experiment by semi-quantitative PCR. When we used the same batch of RNA as in the SHH experiment, or RNA isolated from other stages of seed development, or from other tissues, we found expression levels of the two housekeeping genes to be more or less the same in GM077 and BP034. Furthermore, expression levels were constant throughout seed development and in different tissues of mutant and wild-type rice (Figure 3A, B). Importantly, we observed that the cDNA for eEF-1 α could be detected in the tester (GM077) and driver (BP034) samples prior to SSH, but not in the sample after subtraction hybridization (Figure 3C), lending support to the validity of the SSH approach. We also chose some additional genes, related to starch biosynthesis and carbon portioning (Materials and Methods) to further verify the reliability of the SHH experiment and to obtain detailed quantitative data on gene expression in the two rice lines. 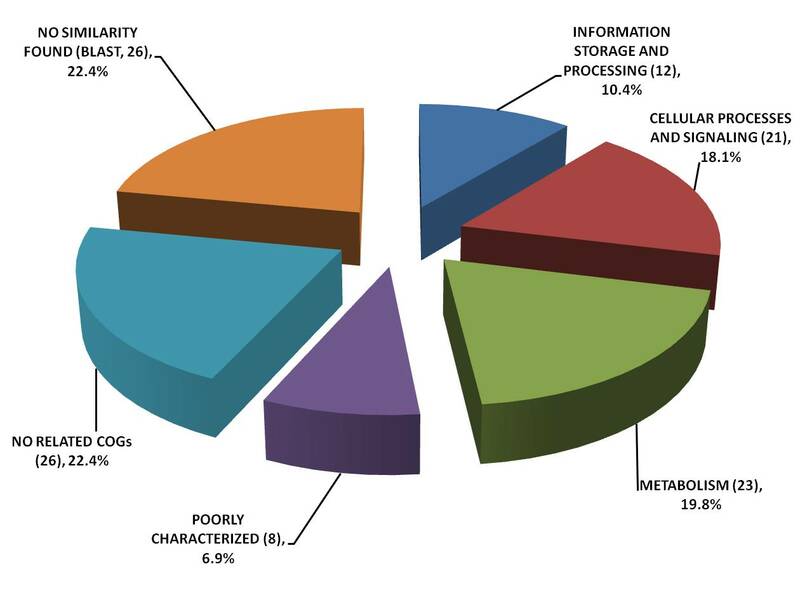 Results from those analyses are presented below. Validation of the suppression subtractive hybridization (SSH) results by semi-quantitative RT-PCR. 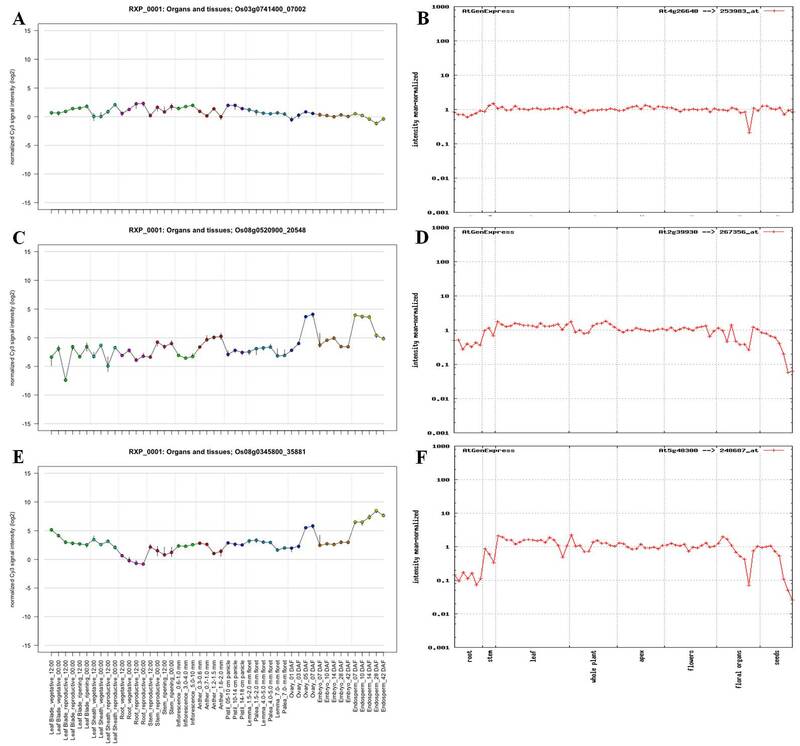 (A) Semi-quantitative RT-PCR analysis of eEF-1α on the same RNA samples from BP034 and GM077 as used in the SHH experiment, i.e., RNA from seeds of 12 day after flowering (Se12), and samples from the same time point for leaves (L12), roots (R12), and stems (St12). 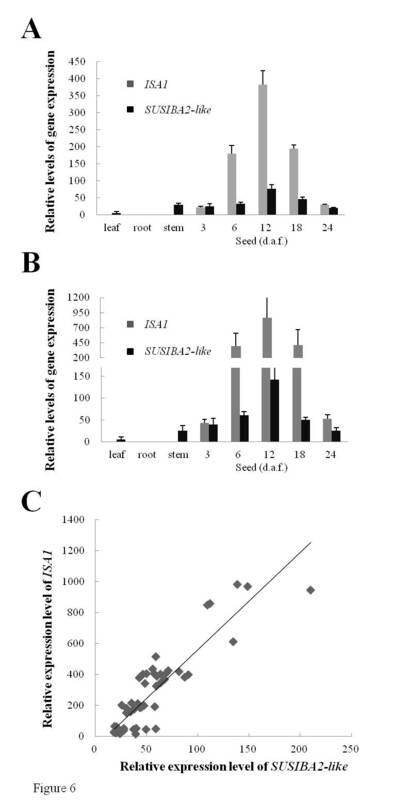 (B) Semi-quantitative RT-PCR analysis of UBQ5 on RNA samples as in the SHH experiment (Se12), and for seeds from 3, 6, 18 and 24 day after flowering, and for leaves (L12), roots (R12), and Stems (St12), respectively. (C) Semi-quantitative RT-PCR analysis of cDNA levels of eEF-1α before and after subtractive hybridization. To further validate the results from the SHH experiment and to quantify expression of genes involved in starch biosynthesis and/or carbon portioning, we chose 19 genes as representatives for gene expression analysis by qPCR, including two reference genes, eEF-1 α and UBQ5 (Additional file 5). According to the results obtained by qPCR, we divided the genes into five groups (Figure 4; Table 3). The classification was based on qPCR quantification of the differential gene expression in GM077; “significantly decreased” (P < 0.01), “not changed” (P > 0.05), “increased” (P < 0.05), “significantly increased” (P < 0.01) and “not detected”. Intriguingly, among the four significantly increased genes, AGPS, SBEI, ISA1 and SUSIBA2-like, all except SBEI were found in the SHH library. We noted that the expression level for the upregulated genes in GM077 correlated well with the expression level for the SUSIBA2-like transcription factor gene (Figure 4). qPCR analytic results of gene expression levels for 13 detectable genes potentially involved in carbon portioning between starch and other carbohydrates. Biological triplets (seeds of 12 days after flowering from three different plants) and technical triplets were performed. The difference between BP034 and GM077 was analyzed statistically by the ANOVA test and presented as “increased” (*P < 0.05) and “significantly increased” (**P < 0.01) between the two rice cultivars. Error bars are as indicated. AGP (gene for ADP-glucose pyrophosphorylase), UGP (gene for UDP-glucose pyrophosphorylase), SS (gene for starch synthase), SUS (gene for sucrose synthase), BE (gene for branching enzyme), ISA (gene for isoamylase), SUSIBA2-like (gene for sugar signaling in barley 2 - like). Sun et al. [33, 34] have demonstrated that ISA1 and SBEIIb in barley were upregulated by the activity of the SUSIBA2 transcription factor and a good correlation in gene expression levels has been demonstrated between SUSIBA2 and its target genes, such as ISA1 and SBEIIb[33, 34, 44]. To learn if this correlation holds true in rice also, and in an effort to find SUSIBA2-like-controlled genes in rice, we selected rice ISA1 as a representative to study the correlation in expression between SUSIBA2-like and its target genes in rice. For this study, we chose different tissues and different time points in both the mutant GM077 and the wild type BP034. As displayed in Figure 5A and B, there was an excellent correlation between expression levels for the two genes in the analyzed samples. The statistical analysis (Figure 5C) indicated that the relative levels of the spatial and temporal expression for the two genes in both rice lines shared a Pearson correlation coefficient (r) of 0.90 (P < 0.01). qPCR analysis of correlation between ISA1 and SUSIBA2-like in gene expression in BP034 and GM077. (A) Spatial and temporal expression levels of ISA1 and SUSIBA2-like in the BP034 rice. 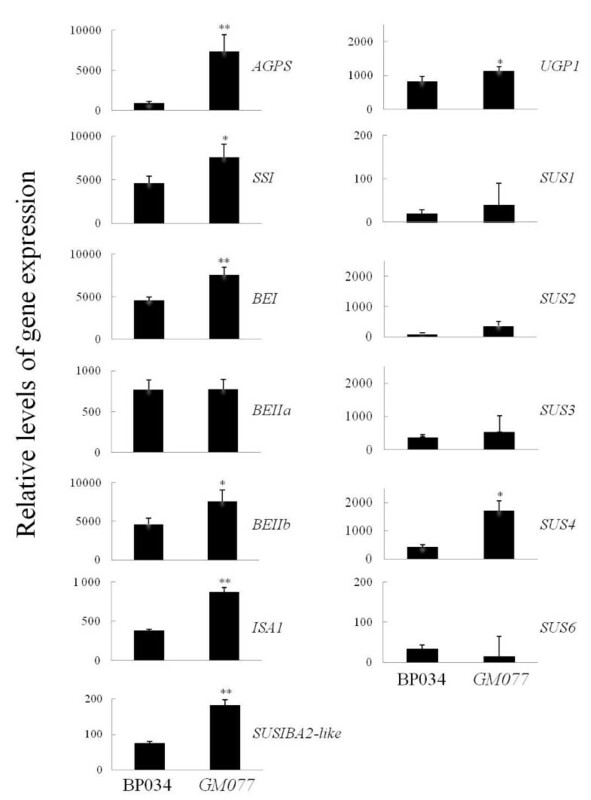 (B) Spatial and temporal expression levels of ISA1 and SUSIBA2-like in the GM077 rice. (C) Plots of corresponding expression levels of ISA1 and SUSIBA2-like in both BP034 and GM077. Statistical analysis indicated the correlation to be extremely significant (P < 0.01) between both ISA1 and SUSIBA2-like with 0.90 of Pearson correlation coefficient (r). daf (days after flowering). Although waxy mutants of higher plants and the responsible gene (GBSSI) have been studied to a large extent, and the high content of amylopectin in the mutant is known [39, 45–53], little information about carbon partitioning to other carbohydrates and oil fractions in waxy mutants has been reported. Moreover, gene regulation of carbon reallocation to amylopectin in the mutant is poorly understood. We are interested in the partitioning of photosynthates between starch and other storage compounds in cereal seeds. In this study, we selected one of the rice waxy mutants to follow carbon partitioning between starch and other carbohydrates when amylose biosynthesis is impeded. Our carbohydrate analysis indicated that when the amylose content is reduced, the vast majority of the assimilated carbon is reallocated to amylopectin, rather than to other carbohydrates or lipids. Interestingly, such a reallocation did not change seed weight but, rather, shifted carbon from one compound (amylose) to another (amylopectin) within the starch biosynthesis machinery. To understand the molecular mechanisms controlling the increase in amylopectin biosynthesis, we set out to identify genes that were upregulated in the waxy mutant. From the SHH experiments we found three candidates that have previously been shown to be directly involved in starch synthesis and/or its regulation, AGP, ISA1, and SUSIBA2-like. The functions and regulation of AGPase and isoamylase have been reviewed and well documented previously [27, 45, 56–59]. In cereal endosperm cells, there are two forms of AGPase, one cytosolic and one plastidic. The major fraction of ADP-glucose in cereal endosperm is believed to be produced in the cytosol and then transported to the amyloplast for subsequent starch biosynthesis. Isoamylase is suggested to play an important role in amylopectin biosynthesis and starch granule formation [45, 56–58]. Both AGPase (cytosolic form) and ISA1 have been demonstrated as important players in amylopectin synthesis and starch granule formation in rice . Our qPCR results indicate that AGPase S (cytosolic form)  and ISA1 are instrumental for the accumulation of additional amylopectin in the amylose–reduced mutant GM077. In the SHH experiment, we could not confirm that the identified AGPS corresponded to the cytosolic enzyme as the unigene sequence did not cover the transit peptide sequence region. However, our qPCR analysis of both cytosolic (Figure 4) and plastidic (not shown) forms according to Ohdan et al. indicated that clone ID No. 74 should be the cytosolic form. The mechanism behind the elevated expression of AGP and ISA1 in the rice mutant remains unclear. One possibility for the enhanced AGP activity could be that the total amount of AGPase needs to be increased to provide ample supply of ADP-glucose when more plastidic AGPase is being recruited to multienzyme complexes for the regulation of carbon partitioning . Another possibility is that the extra AGPase is required in GM077 to convert Glc1-P to ADP-glucose in the cytosol (see also below). Since ISA1 is generally accepted as an important player in amylopectin synthesis and granule formation [45, 56–58], it is not surprising that the ISA1 expression in GM077 significantly increased when extra amylopectin was produced in the endosperm. We also observed that the genes for sucrose synthase 4 and UDPase 1 were upregulated in GM077. Since accumulation of other carbohydrates synthesized from the UDP-glucose precursor, such as cellulose and β-glucan, were unaffected in the mutant, we suggest that the increased expression of the genes for sucrose synthase 4 and UDPase 1 may be also associated with amylopectin synthesis. Sucrose synthase 4 is suggested to be cytosolic  and may produce UDP-glucose, which is converted by UDPase 1 to the hexose-phosphate used for amylopectin synthesis . Indeed, sucrose synthases 2 and 3 in Arabidopsis, which belong to the same group as rice sucrose synthase 4 , have been recently reported to direct carbon to starch synthesis . In our experiment, the elevated expression of cytosolic AGP supports that notion. Enhanced levels of AGPase may be needed to convert the Glc 1-P produced by sucrose synthase 4 and UDPase 1 to ADP-glucose for additional amylopectin synthesis. For other forms of sucrose synthases and for UDPase 2, we did not find any significant shifts in gene expression between GM077 and BP034. This study is centered on carbon partitioning and gene regulation in seeds of a waxy rice mutant. Our results provide no information about how carbon partitioning is regulated at the level of enzyme activity. Lü et al. used transgenic rice with antisense inhibition of GBSSI to examine the activities of major starch synthesis enzymes. Some of the phenotypic traits observed by Lü et al. in the GMO rice were similar to what we found for the GM077 mutant, such as no changes in seed weight and only small changes in total starch content. In accordance with our gene expression analysis, they also noticed an increase in isoamylase activities. However, they did not observe any changes in activities for AGPase or SBEs, which seems to disagree with our results at the gene activity level. We do not yet know the reason for this disparity between gene expression and enzyme activity but it should be noted that the levels of transcripts and proteins in a cell are determined by several factors, like the rate of transcription initiation, mRNA stability, efficiency of translation, and protein stability and modifications. Our knowledge about gene regulation and the involvement of putative transcription factors in carbon partitioning is poor. Sun et al. [34, 35] reported that the barley SUSIBA2 transcription factor participates in sugar signaling in barley and that it upregulates target genes by binding to the SURE-element (with an A/T rich region and a putative AAAA core) within the promoter region [34, 63]. They suggested that the SURE-element(s) in promoter regions of sugar-inducible genes may play an important role in SUSIBA2-controlled gene expression. Interestingly, when we searched the promoter region of the nine upregulated genes in GM077, including the rice SUSIBA2-like, we found a number of putative SURE elements in all of the genes (Additional file 6). A very good correlation at the gene expression level was found for SUSIBA2-like and ISA1. We suggest that upregulation of ISA1 and other genes in the GM077 mutant is mediated by the SUSIBA2-like transcription factor. This notion is further corroborated by recent transgenic studies in rice (Hu et al. unpublished). Interestingly, when we performed a bioinformatic analysis on the gene expression patterns of the three selected genes (SUSIBA2-like, ISA1 and AGPS) from the SSH experiment in this study using the publicly available rice and Arabidopsis microarray data, we found some correlations between SUSIBA2-like and the other genes (Additional file 7). 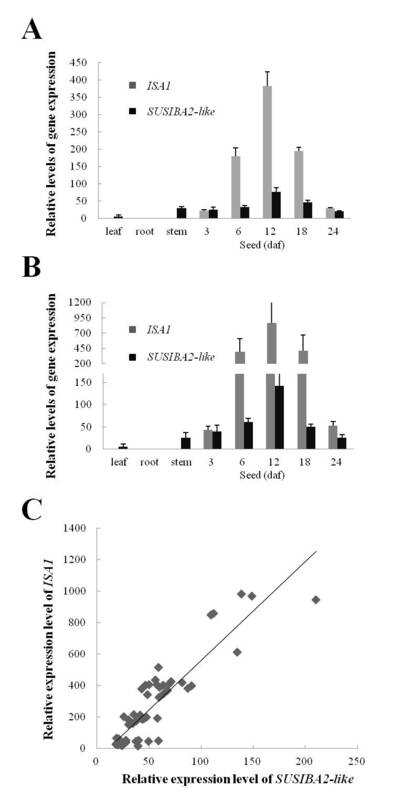 However, ISA1 is expressed in Arabidopsis leaves but not in rice leaves and the expression level of SUSIBA2-like is generally low in both species for reasons we do not know. Since SUSIBA2-like is a transcription factor, its gene expression level should be low. What caused the differential expression of ISA1 in the two species is unclear. In vitro and in vivo protein-DNA interaction studies are under way to further determine the involvement of SUSIBA2-like and SURE elements in the regulation of starch biosynthesis in the rice endosperm. In addition to their high value as starch crops, there is an increasing interest in using cereals for the production of non-starch compounds, such as β-glucan and fructan for functional foods, and oil for biofuel applications [9, 10, 17]. Our experimental data implicate three genes of importance for amylopectin synthesis in the rice endosperm, AGP, ISA1, and SUSIBA2-like. Since AGPS and SUSIBA2-like likely control the entire metabolic pathway for starch synthesis in cereals, we believe they are good targets for redirecting carbon flux from starch biosynthesis to alternative products. In fact, approaches to downregulate AGPS in Arabidopsis to enhance oil production at the expense of starch biosynthesis met with success . It will be interesting to explore the potential for modulating SUSIBA2 activity as a strategy for rerouting photosynthate from starch biosynthesis to other anabolic pathways in cereal seeds. Understanding of carbon allocation in cereal seeds is of great importance in plant biology. In this study we used a rice waxy mutant to gain molecular insights into how amylose deficiency affects carbon allocation in cereal seeds. Analysis of carbohydrate and oil fractions in the waxy mutant showed that when amylose is deficient, carbon is mainly allocated to amylopectin rather than to other carbon end products, such as β-glucan or oil. Gene expression profiling identified several candidate genes implicated in the carbon reallocation response. These genes included AGP and SUSIBA2-like. We suggest that these two genes are promising targets in efforts to redirect carbon flux in cereal seeds from starch biosynthesis to alternative carbon end products. To our knowledge, this study is the first comparative analysis of carbon fractions and gene expression profiling on a global scale in a waxy mutant. Rice seeds of the BP034 and GM077 cultivars were obtained from the waxy rice-breeding program at the Institute of Nuclear Agricultural Sciences, Zhejiang University, China. The GM077 mutant was originally generated by γ-irradiation in the waxy rice-breeding program [36-38, Bao et al. unpublished]. It has been developed to a nearly isogenic background through many years of breeding. The rice plants were field-grown on the campus farm at Zhejiang University. Individual tillers were labeled at flowering. Seed samples were harvested on day 3, 6, 12, 18 and 24 after flowering, respectively. At least 6 panicles from different individuals of BP034 or GM077 were sampled at each time point. At the same time points (day 3, 6, 12, 18 and 24 after flowering), the leaves, stems and roots of the corresponding rice plants were harvested. The harvested tissues were immediately frozen in liquid nitrogen and kept at -80°C until use. Mature and dry seeds were prepared as described previously [44, 64, 65]. Iodine staining and spectrophotometer scanning were performed as described by Sun et al. . Total starch and amylose contents were pre-analyzed as described by Sun et al. . Dietary fiber components were analyzed with the Uppsala method  and fructan (including fructooligosaccharides) as described by Rakha et al. . Total dietary fiber was calculated as the sum of fiber components analyzed with the Uppsala method and fructan. The mixed-linkage β-glucan content was analyzed as described by McCleary and Codd , the starch content as described by Santacruz et al. and the amylose content as described by Chrastil . The arabinoxylan content was calculated as the sum of arabinose and xylose residues determined by the Uppsala method, the cellulose content as the difference between glucose residues determined by the Uppsala method and the mixed-linkage β-glucan content, and the amylopectin content as the difference between the starch and amylose contents. Free Glc and Suc were analyzed according to Bergmeyer et al. and Bernt and Bergmeyer , respectively. The crude oil content was determined according to the European standard method . Oligonucleotides used in the experiments for qPCR, semi-quantitative PCR, and SHH are listed in Additional file 5. Nineteen representative genes were selected including the two reference genes eEF-1α and UBQ5. The oligonucleotides were purchased from Invitrogen (Carlsbad, CA, USA). Total RNA was isolated according to the protocol described previously [34, 35]. 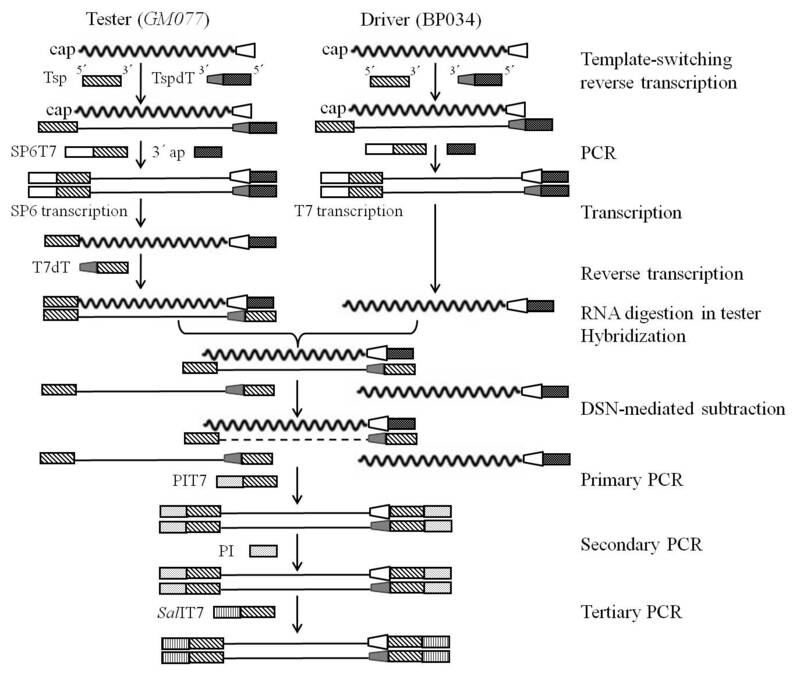 qPCR and semi-quantitative PCR were performed as described previously [34, 73]. The SYBR Green Master Mix and cDNA synthesis kit were purchased from Toyobo (Osaka, Japan) and Promega (Madison, WI, USA), respectively. A real-time PCR machine, iQ5 from Bio-Rad (Hercules, CA, USA), was used for qPCR and a PCR thermo cycler, MJ Research PTC-200 (GMI, Ramsey, MN, USA), was used for semi-quantitative PCR. The rice genes of eEF-1α and UBQ5 were used as endogenous references for data normalization  in qPCR. The relative transcript level was calculated by the method of 2-ΔCt. The cDNA subtractive library of GM077 vs BP034 was constructed using the SSH technique . Total RNA of GM077 from seeds at 12 daf was used as the tester and the corresponding sample of BP034 as the driver. The protocol in Dai et al. was followed with the following modifications: i) Transcripts were enriched by in vitro transcription; and ii) Duplex-specific nuclease (DSN)-mediated normalization and subtraction were used. The procedure is outlined in Additional file 8, and all linkers, adapters and PCR primers are listed in Additional file 5. PCR products generated by SHH were digested by SalI and cloned in the pUC19 vector. Recombinant plasmids were used to transform Escherichia coli DH5α. Transformed bacteria were applied to LB plates containing 50 μg ml-1 ampicillin for selection and 40 μg ml-1 X-gal for detection of α-complementation . White and positive colonies were picked for colony PCR screening to check inserts. Positive colonies with inserts were propagated. Plasmids were isolated and sequenced at Beijing Genomics Institute (BGI, Beijing, China) using the M13 forward and reverse primers. The eEF-1α gene was used to monitor efficiency of the suppression subtractive hybridization by semi-quantitative PCR. The obtained sequences were edited by the DNAstar® software (Madison, WI, USA). Unigene sequences were used for BLASTX and TBLASTX searches against the protein database (http://blast.ncbi.nlm.nih.gov/). The retrieved proteins with high sequence similarities (E-value < 10-5) were categorized using the NCBI KOGnitor COG classification (http://www.ncbi.nlm.nih.gov/COG) based on the method of Tatusov et al. . The cis-element analysis of gene promoters was performed using the BioEdit software (Carlsbad, CA, US). The significance of differences in obtained data was tested by ANOVA (analysis of variance) with a threshold P-value of 0.05 (http://www.ats.ucla.edu/stat/). Publicly available microarray data for rice (http://ricexpro.dna.affrc.go.jp) and for Arabidopsis (http://www.weigelworld.org/resources/microarray/AtGenExpress) were used for bioinformatics analyses of gene expression patterns of SUSIBA2-like, ISA1 and AGPS. Ming-Zhou Zhang, Jie-Hong Fang contributed equally to this work. · The SLU Lärosätesansökan Program (TC4F) for Team 4 supported by Vinnova. · The SLU program BarleyFunFood. · The Natural Science Foundation Program (Y3090617, Y304463) supported by Zhejiang Province, China. · The Swedish Research Council for Environment, Agricultural Sciences and Spatial Planning (Formas) under the Strategic Research Area for the TCBB Program. · The Joint Formas/Sida-funded program on sustainable development in developing countries. · The Swedish International Development Cooperation Agency (Sida/SAREC). · The Carl Trygger Foundation. · The Swedish Farmers’ Foundation (SLF). · In part by the U.S. Department of Energy Contract DEAC02-05CH11231 with Lawrence Berkeley National Laboratory. M-ZZ and J-HF did the experiments of SSH, semi-quantitative and qPCR, starch pre-analysis and bioinformatics analysis. XY carried out statistical and promoter analysis, and partial bioinformatics analysis. JL did partially the experiment of qPCR. J-SB did the breeding work in many years to generate the nearly isogenic waxy mutant, GM077. GF performed the carbohydrate and oil analysis. RA, CJ and PÅ were involved in the carbohydrate and oil analysis and in revising the manuscript. CS contributed to the experimental design, coordination of the study, drafting the manuscript and interpreting the results. All authors read and approved the final manuscript.